We have gotten up at 0600 for the past three mornings, taken Daisy ashore, raised the dinghy and secured it in hopes of leaving. Today we left. We weren’t anxious to leave, but since the Joe Sound inlet is so precarious if conditions aren’t right, it was best to exit through it while we could. The sun came up into heavy clouds, but they cleared away soon and the skies were their typical blue with white fluffy clouds. This morning, after Daisy’s beach walk, Mark checked out the inlet from the dinghy and it looked good, so we finished our preparations to leave. First, he had to deliver fresh caramel rolls which I made last night and baked this morning to Interlude. Then we raised the anchor and motored out the inlet. As seen in the photo above it was high tide. That is what Joe Sound looks like at high tide. The photo at the left was taken yesterday at low tide when the water disappears and you can walk across most of the area covered with powdery sand. In that photo, there is a small “thing” in the middle of the sand. When we first arrived, from a distance I thought it was a barbecue grill someone had left on shore. It is actually a small piece of mangrove. It disappears underwater at high tide. 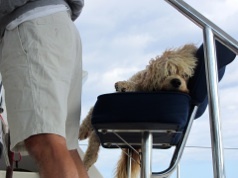 Daisy knew that we were leaving even before we raised the anchor. She has gotten used to our preparations. The sunshades are rolled up, the hatches are closed, rugs in the cockpit are put in a safe place, the sailbag is unzipped and ready for the mainsail to be raised, instruments in the cockpit are uncovered and turned on, we do a radio check on the VHF, we put foam covers on the lines holding the dinghy straps and tighten them, the engines are turned on, the bridle is taken off the anchor chain, and the anchor is raised. 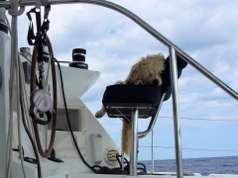 Partway through this procedure, Daisy “assumed the position” and curled up at the helm. She did not eat her breakfast (who knows how long it will be before the next beach walk), and drank no water. We left the inlet first and easily cleared the sides. Interlude followed. Besides considering wind and waves, we would only leave with bright sun shining on the water so we can see the rocks and sand on the sides. Once out in Exuma Sound, we turned into the wind, put up both sails and set our course for Georgetown. 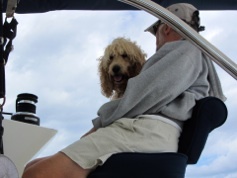 Once we were on our way and the auto pilot was turned on, Mark sat down and Daisy jumped up on the seat beside him. This used to be my spot, but Daisy has recently decided she likes to see what is going on in all directions, in particular watching for the next shore to come into view, meaning the next beach for “Daisy walks.” Occasionally, Mark has to stand and then Daisy takes over the whole seat. Sometimes Mark leaves the helm to check the sails, get a cup of coffee or perform some other task. 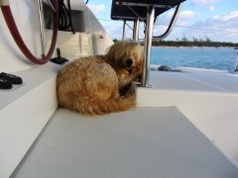 Daisy is happy to take her watch alone, and luckily hasn’t had to turn off the auto pilot and steer us away from anything or trim the sails. Notice the leg off to the side and the tail hanging down. She’s come a long way from the dog who four years ago would not leave her position under the wheel for any reason until I walked to the forward deck to lower the anchor. She still knows better than to walk around freely on the deck while we are underway and we watch her movements carefully if she comes down the steps into the cockpit to get a drink of water or find another place to sleep. 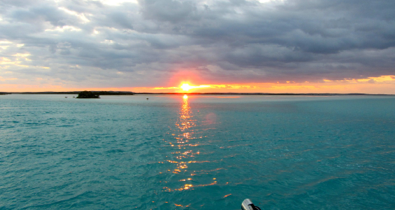 The trip between Long Island and Georgetown is quicker when going across the Exuma Sound from Joe Sound than the route we took sailing along the shore and bank to Salt Pond. We dropped anchor in less than four hours. Back in Georgetown, we hung clothes that had been washed on the way over here, lowered the dinghy and went ashore. We had four small bags of garbage to put in the dumpster left for cruisers and then walked across the street to Immigration. Our permit is up next Wednesday, April 3, but since the office will be closed until Tuesday for the Easter holiday, the officer checked us in today and stamped our passports. (If we had been given our full six months on January 3rd, this trip to immigration wouldn’t have been necessary.) Then it was on to the grocery stores for fresh produce, ice cream, cheese, and a few other items we needed. Eggs were sold out, perhaps for Bahamian children to color. This is a very religious country and everything is closed on Good Friday, Easter, and Easter Monday so today the lines in the two Georgetown grocery stores were long and some fresh goods were picked over. Tonight, we watched American Idol on TV. Our satellite dish doesn’t work here, but four network US stations and two Bahamian stations are broadcast in Georgetown. Once we get a little farther north, we’ll receive our satellite signal again, although we aren’t watching very much TV here. 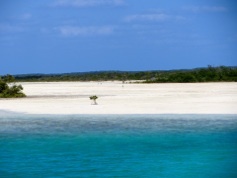 We will leave sometime next week, either going north to stop at the cays we missed coming south, or if the weather is favorable, we might go south to the Jumentos. As always, plans are written in sand.